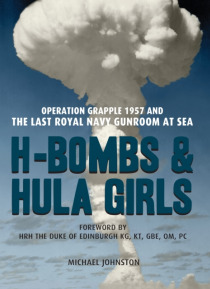 Published to coincide with the 60th anniversay of Britain's first successful thermonuclear bomb testing in the Pacific, H-Bombs and Hula Girls tells the tale of ten young men brought together through National Service in the Royal Navy and taking part in Britain's top secret tests near Christmas Island. They experience at extremely close quarters what the world is told were three megaton H-bomb exp… losions, going on to show their country's flag in Hawaii, then around the South Pacific, and finally round all of South America. Theirs is the only British warship ever to sail directly from Port Stanley to Puerto Belgrano, mooring next to the Argentine flagship General Belgrano. H-Bombs & Hula Girls evokes the Cold War atmosphere of Britain in the 1950s and the race to secure the nation's place among the thermonuclear powers, but also paints the picture of a heterogeneous group of young men enjoying life-shaping experiences together: learning to be sailors, exploring island paradises, participating in three vast explosions, being their nation's goodwill ambassadors as they encounter completely different cultures, and here and there experiencing life-threatening moments and even having their hearts broken. This fascinating memoir of the last Royal Navy Gunroom at sea, crafted from journals, letters, and contemporary records, plus the wonders of hindsight, culminates in the surprising realisation that Operation Grapple may not have been quite what it seemed.